I made it out of the house today!! Trip and Robert were taking the truck into town so I bummed a ride down to the highway and headed towards Belmopan on the 8 o'clock bus. I'm pretty sure I fell asleep on the way there for at least a little while because I felt like I desperately needed some coffee when I got to the bus terminal. Instead of getting on the next bus out towards Cayo I went across the parking lot to Caladium for breakfast and coffee. When I got on the 10:30 bus heading towards Benque I found a seat next to a really nice girl who started talking to me about my tattoos. (Small world - I know her brother, a tattoo artist in San Pedro) We ended up chatting for the whole ride and exchanging numbers, and I met back up with her in San Ignacio after seeing Marilee in Santa Elena to get my hair done. Janell (that's her name) brought her niece and her friend Ricky to meet me and we all walked back to Janell's house, where I met her sweet grandparents and two puppies, Rex and Smokey. I tried three new fruits while at their house, too. The first one was call Tuspi, and I can't find ANYTHING about it online, so it must have another name. Of course.... it's the one I didn't take a picture of. It was smaller than a kiwi, orange in color, and sweet when you first bite into it, but then the taste fades and it just feels like you're chewing on mushy chalk. I needed to down a glass of water after I tried it just to "wet my whistle," it was a really, weirdly, DRY fruit. Sweet and juicy - just like any good mango. "Velvet" because of the fuzzy skin. I just realized that I'll probably never be a food critic - things to me are either "good" or "gross," or "mushy" or "crunchy." Not the greatest descriptions, eh? I was invited to eat dinner with the family before heading out to my hotel for the night and was even sent home with some leftovers. Janell said she'll load me up with mangoes and avocados before I go home tomorrow, and she knows where I can get DRAGON FRUIT!!! OMG!! 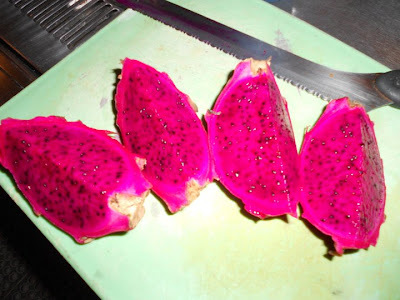 Dragon fruit is my FAVORITE and I haven't been able to find it in months!! I'm so stoked!! Pitaya or "Dragon Fruit." SO frikkin good. I'm so happy that I'm finally meeting some females to hang out with around here... even though Marley and Janell both live about 2 and a half hours away from me, it's still nice to know that they're there if I need to get away from all the boys for a bit. Well.... it's been a long day and I still want to take a shower and post about this hotel I'm staying in before bed. Tomorrows solo trip to Xunantunich has turned into a group outing followed by horseback riding, thanks to my new amigos! I'll let you know how all of that goes, too. Like me on Facebook for daily nonsense, articles, flight deals, pictures, and whatever else I feel like posting!